Microsoft (NASDAQ:MSFT) is set to announce its Q2 2018 earnings on Wednesday, January 31. The company continues to develop an ecosystem of cross-device applications and value-added services around its hardware and software. This has resulted in strong growth for its Office, Server, Operating System and hardware divisions in the first quarter of 2018. We expect Microsoft’s revenues to improve to $27.2 billion during the quarter. We have created an interactive dashboard that illustrates our expectations for various divisions. 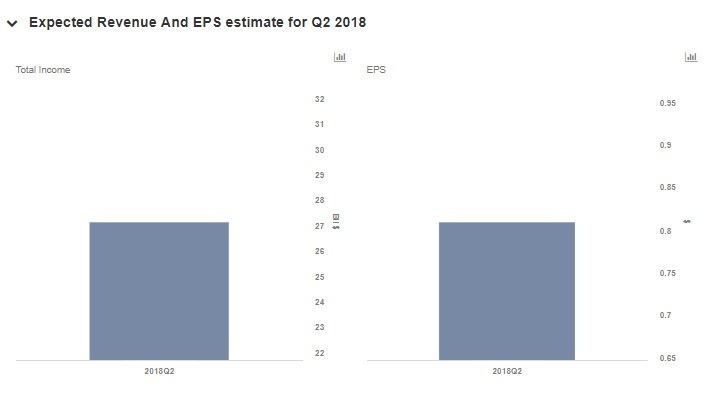 You can modify the revenue and operating profit expectations for each division to see how the EPS will be affected in Q2 2018. During this earnings announcement, we will continue to monitor the company’s growth in cloud services, and expect it to report growth across verticals. Below are our expectations for the earnings announcement. Microsoft’s Office Productivity revenue is expected to increase for Q2 as cloud revenues from both commercial and consumer Office 365 grow. Microsoft Dynamic, which reported solid growth in revenues in the first quarter of 2018, is expected to report yet another quarter of revenue growth. Meanwhile, Microsoft’s Intelligent Cloud – which includes Azure, Server products, and enterprise services – is witnessing good adoption as Cloud and Big Data analytics continue to gain popularity among its clients. In the previous quarter, Intelligent Cloud revenues grew by 14% as Server products and Cloud services grew 17%, driven by growth in Azure revenue. In Q2, Microsoft continued to ramp up its Azure platform to boost its cloud revenues through IaaS and PaaS solutions. As a result, we expect that the revenues for Azure will continue to grow in the quarter. We expect Intelligent Cloud revenues to grow by 12% during the quarter due to traction in server products (SQL Server and Windows Server) and cloud services. Despite a slowdown in PC sales, Windows OS revenues have reported growth in previous quarters. We expect that Windows OS sales for both Windows OEM non-Pro and Pro will continue to outperform PC sales in this quarter. As a result, the More Personal Computing will likely report marginal growth for Q2. The company continues to aggressively push into the hardware market with its Surface line of devices. In this earnings announcement, we will continue to monitor the growth in revenues for Surface devices. At present, we have a $87 price estimate for Microsoft, which is slightly below the current market price.